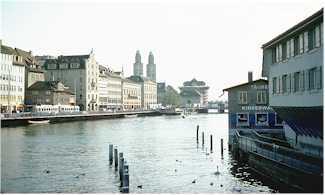 ABOVE: Zürich's Limmat River, looking in the direction of the lake, with the Grussmünster's towers in the distance. See how much time you have. If you have four hours between flights, you should have plenty of time for a trip into the city. The train trip takes only 10 minutes, but you might have to wait 10 or 15 minutes for a train in each direction. For safety's sake, allow 1-1/4 hours for the roundtrip, plus enough time for security and boarding (and for check-in, if you don't already have a boarding pass for your next flight). Tip: If you're short on time, skip a city excursion and catch a local train to nearby Oerlikon, a Zürich suburb where you can have a snack, visit the shops, or walk around and see how the Swiss live before returning to the airport. Take a train into town. In Zürich Airport, take the escalators downstairs to the underground railway station. There, you can buy a roundtrip ticket to Zürich Hauptbahnhof (the main railroad station) and catch a train into the city. To reach the Bahhofstrasse, take the escalator to the railroad station's underground shopping mall (ShopVille) and come up the Bahnhofstrasse escalator on the other side of the Bahnhofplatz. The Bahnhofstrasse lies straight ahead. Walk all the way to Bürkliplatz at the far end for a view of Lake Zürich. During the warmer months, you can rent a paddleboat or go for a short excursion on a lake steamer. ABOVE: Evening on the Limmat. The Fraumünster and St. Peterskirche are on the left; the Grossmünster is on the right side of the river. Catch a tram back to the railroad station via the Bahnhofstrasse. Or, if you have a little more time, cross the bridge across the River Limmat to Bellevueplatz. Turn left and follow the left bank of the Limmat on foot or by tram until you reach the Bahnhofbrücke ("Railway Station Bridge"), stopping at the Grossmünster church along the way. Then turn left and walk across the bridge to the main railway station, where you can catch the next train to the airport. Another option is to cut inland at Bellevueplatz and take the R�mistrasse uphill to Oberdorfstrasse, then turn left and work your way through the Old Town until find yourself back at the river next to the Bahnhofbrücke. If you reach the Bahnhofbrücke with time to spare, you might want to ride the Polybahn from its lower station near the bridge to a terrace by the Federal Institute of Technology for a view of the city. The fare is modest, the ride is quick, and the funicular departs at three-minute intervals throughout the day. When it's raining, the National Museum Zürich (Schweizerisches Landesmuseum) is a wonderful place to spend several hours. It's in a park immediately to the left of the Hauptbahnhof as you leave the station by the front or main exit. 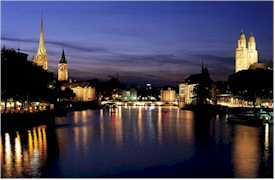 During summer, you can take a sightseeing cruise on the Limmat River. The pier is near the National Museum Z�rich, and boats depart every half hour or so. Finally, if you have children with you, ask the tourist office for directions to the nearest playgrounds. There are several within walking distance of the railroad station. The Zürich Zoo is another possibility, if you don't mind a long tram ride or expensive trip by taxi up the Zürichberg. This index has links to our articles on Zürich.